If you’ve picked up the Flicker Alley releases of the other Cinerama releases this film may not be required viewing- except that that the Flicker Alley has a commentary track that makes it a must see. The talk by David Coles is awesome. 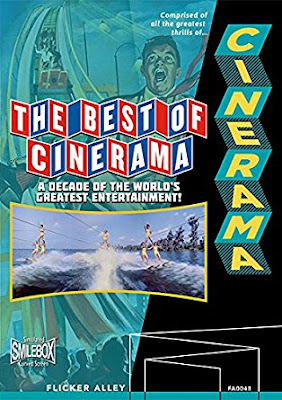 Covering the production of all the previous Cinerama films the commentary tells you everything you’ll want to know about the making of all of the films. It’s incredible and it puts the whole production process into context with the result that you really appreciate the films even more. I know several of the other films have commentary tracks, and they are all excellent but there is something about this one that workers better. I'm guessing it's because Coles ties the films together in ways that make clearer sense since we are seeing sections of the other films.. In a weird way this maybe my favorite Cinerama release because it’s all the high points, and it has a killer commentary. Highly recommended-especially if you're getting the Flicker Alley release.